Altay®. 3x life size. Model is useful for teaching the correct way to brush teeth. A giant toothbrush is included. Mounted on base. Altay®. 3x life size. 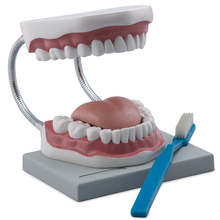 Model is useful for teaching the correct way to brush teeth. A giant toothbrush is included. Mounted on base. Size, 15 x 16 x 22 cm.